We were in a boring breakfast rut, so a few months ago I bought a box of Pop Tarts to liven things up. The Pop Tarts were well received, but now Pop Tarts are all anyone wants to eat for breakfast. Not that there’s anything wrong with Pop Tarts, they’re fortified with vitamins, don’t have any trans-fats and hey – some flavors are even vegan. However, I thought it might be a good idea to mix things up a bit, so I decided to try Chocolate Muffins with Ricotta Cheese. 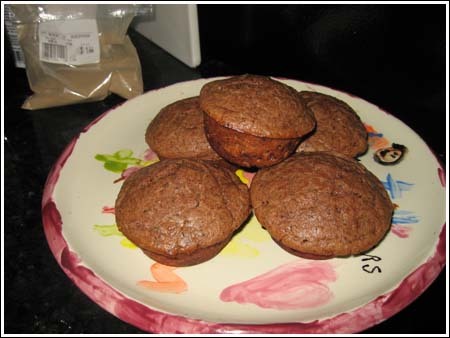 These chocolate muffins were recommended to be by a Cookie Madness reader named Liz. What makes them special is that they use a full cup of ricotta cheese. They are moist and delicious and you can pretend that they’re healthy since they come from Mollie Katzen and since they have the ricotta. I didn’t make any changes, so rather than post the recipe here, I’m directing you to Mollie Katzen’s page. If this recipe ever disappears, let me know and I will re-type it. One thing to note is that the recipe lists chocolate chips in the ingredient list, but does not say when to add them. I added them at the end. Also, if you have a muffin tin with 6 indentations, this recipe can very easily be halved. Oh my, glad to see one of my favourite muffin recipes being lauded! These are SO good; for some reason, my husband does a better job of making them than I do. It’s from Mollie Katzen’s “Sunlight Cafe”, which is a really good breakfast cookbook. Love your blog! Makes me want to run to the kitchen and put on my apron. So far, all of the muffins have been pretty different. Overall, I think I like the King Arthur muffin the best. Now it’s not the moistest, but moistest, but it rose the highest and seemed the sturdiest. It was also very chocolaty, yet not too cupcake-like. The Diana’s Dessert muffin was probably the moistest. Hey, glad to see that you tried them. This is by far one of my favorite muffin recipes. I usually freeze most of them, and then when I’m in a hurry in the morning, I nuke them for 60 seconds. Warm, chocolaty, and wonderful!